I felt complete as a woman and excited to face motherhood the first time I gave birth. My body shape, though, had changed dramatically after being pregnant and I had gained a lot of weight compared to how I was a year before. After a month of giving birth, my belly appeared to be nearly as big as it was while I was pregnant, which concerned me. I went to see my obstetrician-gynecologist for advice and was informed that it would take some time before my tummy returned to its normal shape, but through effort and determination I was assured it was possible to regain my figure – and it was. Remember to consult your doctor first before doing exercise to achieve good results. Regular exercise, a balanced diet and add-on supplements like the kind available from Atlantic supplements made the process of getting back to my ideal weight and in shape easier than I thought it would be. Re-strengthening my core to get rid of my jelly belly and regaining my body shape took months, a year to be exact. As well as doing recommended exercises such as stomach crunches to tighten up my abdominal muscles, I played badminton and with the aid of innovative sports supplement like Drivensports, I gained back my pre-pregnancy figure. 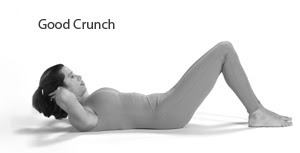 Breathing techniques will shorten the abdominal wall to its prior length because the muscles in your stomach must first shorten before they can be strengthened. While you may want to lose as much weight as possible, it’s not healthy to do so, especially if you’re breast feeding as your baby needs proper lactating nutrition. Instead, do gradual forms of exercises at first like walking and brisk walking. Don’t push yourself too hard, too soon. It takes patience and discipline to get back to your desired shape and figure, sodon’t be easily discouraged. Before doing all of these, it is always best to first consult with your doctor on what kinds of exercise can you do, especially if you underwent a C-section.